Honeywell - 50250-S : Air Purifier Review • The Air Geeks, reviews of air conditioners, dehumidifiers and air purifiers. The 50250-S is a round, powerful air purifier that is suitable for relatively large spaces. Based on the “true” HEPA filtration mechanism, it is capable of removing a nearly all contaminants from the air in your room. It is optimized to remove various types of airborne pollutants including bad smell, germs, and other particles. In addition, this unit offers a highly effective airflow mechanism to ensure that your room is free from dirty and smelly air. On paper, this unit will clean and sanitize the air in your room and let you enjoy every single second that you will spend there. But does it stand to the test of the Air Geeks? Our review. In case you have a large room and you are looking for a powerful system to purify the air, then the 50250-S is designed to suit your needs. This round (18 by 18 by 19 inches) unit is ideal for spaces that are as large as 390 square feet. This makes it suitable for a wide range of uses. It is ideal for use in large living rooms, bedrooms, offices, labs, and more. 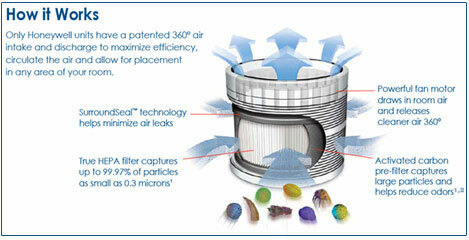 HEPA technology is known for its powerful capability to remove contaminants from the air. This system utilizes the so called “true” HEPA filtration mechanism and it is capable of removing 99.97% of pollutants from the air in your house. In addition, this highly effective mechanism is capable of capturing minute pollutants, removing pollutants that are as tiny as 0.3 microns. This system is, hence, ideal for removing mold spores, dust, pollen, pet dander, tobacco smoke, and more. This air cleaner comes with a durable HEPA filter that is designed to go for up to 5 years. You can vacuum the filter from time to time to remove trapped dirt – this is a pretty easy task that takes no more than 3 minutes. In addition to the HEPA filter, this unit features a carbon activated pre-filter that is ideal for capturing larger particles such as lint, dust, and fur. Furthermore, this filter reduces household odors to give your room a fresh air smell. Failing to replace the filters at the right time can lower the effectiveness of your air purifier. This system is specially engineered to ensure that pollutants are kept away from your lungs. It features an Intelli-Check Electronic Filter Indicator that alerts you to replace the filters. With this system in your house, you will not need to mark replacement dates on your calendars or set reminders! To give you an idea, we recommend you replace this filter every 3 months. The effectiveness of an air purifier is largely determined by the filtration mechanisms it employs. It is also influenced by how it is designed to take and discharge air. The round design of this air purifier enables it to collect air from all directions. Apart from its 360 degrees air intake, it discharges purified air in all directions thus making it an ideal option for relatively large spaces. In addition, its round design enables a user to place it anywhere in the room. You should always check the CADR rating of an air conditioner before purchasing one. The 50250-S air purifier is AHAM Certified and its CADR ratings are as follows: 250 for dust; 250 for smoke; and 250 for pollen. This air purifier is therefore suitable for a large space (up to 390 square feet). However, consumption and noise are two imperfections. The Honeywell unit’s three were measured at a respective wattage of 89 W (low), 143 W (medium), and 185 W (high). Energy consumption is therefore a possible improvement for future models. This unit produces a “white noise” that is hard not to notice. It should be placed in rooms where you intend to work, or play music. Powerful. The 50250-S is a powerful air purifier that offers great performance. 360° air input and discharge. The round design enhances the overall effectiveness of this air purifier. Most users have observed that the system works well when placed anywhere in the room. Easy maintenance. You can easily vacuum its filter to remove trapped dirt. In addition, its Intelli-Check™ Electronic Filter Indicator enables users to replace filters without marking the replacement dates anywhere. Relatively high noise level. Although most systems of this kind are expected to produce some noise, a fraction of users feel that this system is noisier than other air cleaners of similar capacity. High power consumption. The impressive performance has a price : its power consumption is higher than for most models. Let me start off by saying that I suffer from being allergic to cigarette smoke and my husband and I live in an enclosed apartment complex. This is made worse by the fact that the front door doesn't seal up against the frame and smoke from the hallway leaks into our apartment with other odors and smells. Now let me add that that my husband suffers from severe allergy's and takes medicine daily for his condition. Did I mention that we have two cats and a pug. Life was miserable in our 2 bedroom 2 bath apartment, till this little puppy showed up. It's just like the picture describes it, like a barrel, the nice feature on it is the Intellicheck, this little feature tells you when to change the filters and it's quite easy the pre filters just lay on the hepa filter and are held in place by two pieces of Velcro. They do need to be changed about ever two months though, this may be more then normal because of our pets. But since we got the first one for the living room we added one more to the bedroom. Now you walk down our hallway gagging on the scent and odors but as soon as you open our door you are greeted by the clean smelling air and the sound of the filter cleaning it. Okay it is a little loud but don't let that discourage you." Picked it up a few weeks ago from a Home Depot. I did end up paying probably $15 more for it than if I had bought it online. That is the way I wanted it because if it didn't work well I could easily return it with no hassle and maybe pick up another one. So I have 90 days to check it out. I purchased it for my basement rec room that is 16'x30' with an 8' ceiling. So I am looking at 480 sq feet. I think the purifier is rated for 340 sq feet... So I consider that close enough. I live in the southwest where it is dusty all the time. I also have a 16 year old cat that needs a good spanking. After two weeks of using the purifier I LIKE IT A LOT. It filters the room fast and leaves you with a really clean smelling room. When I come down the stairs and turn the corner to the rec room you can smell and feel the difference right away. So up to now (two weeks) everything is great. NOW FOR THE ISSUES: My purifier does indeed wobble at low and slighly at the mid range settings. The purifier is sitting on carpet so the amount of vibration that you see is extremely small. I think it may be more of a visual problem than a real mechanical problem. If it was sitting on a wood floor it might bug me but if I liked it I would put it on a rug or get some felt or rubber pads to put under the feet. The way it is now for me is just fine. I also wonder if you could put a small piece of duct tape on one of the blades to try to offset the wobble. You can do this sort of thing with ceiling fans and it seems to work... Just a thought. The second issue is indeed the NOISE. I have read all the reviews and some people are saying that it isn't loud. To these people I say you need to go to an ear doctor (LOL). It is loud on the high setting (Trust Me)." The Honeywell 50250-S pure HEPA air purifier is a highly effective system that removes a very high percentage of pollutants from the air that goes through it. Its filtration mechanism is capable of removing a wide range of common pollutants including dust, pollen, bacteria, viruses, and more. It is designed to trap even the smallest particles that could be hanging in the air, and does the job well. However, its energy consumption is above average, and the noise it produces can bother you if you intend on running it 24/7. By considering the merits and demerits of this air purifier, it deserves a rating of 4/5.